Oxygen gauge, when it is calibrated, has to be far away from oil. Usually, the case of oxygen gauge is sprayed golden steel, and its internal structure is made up of copper. Oxygen gauge is mainly used in oxygen bottle and pressure reducer. Oxygen pressure gauge is also used for welding and cutting machine. There are two main advantages. One is that the price of components is competitive. This is because our factory produces the components and parts. The other is that the performance of the oxygen pressure gauge is pretty good as a result of our strict management and quality control. Oxygen gauge has passed ISO9001:2008 certification. Exact Instrument Co., Ltd is a professional manufacturer and supplier of oxygen pressure gauge in China. Our company can offer OEM business according to clients' requirements. 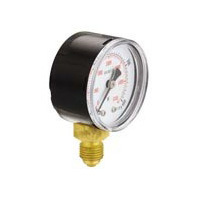 Ammonia gaugeAmmonia gauge is mainly made up of iron and stainless steel. It can be used under most conditions, including humid and corrosive ones.